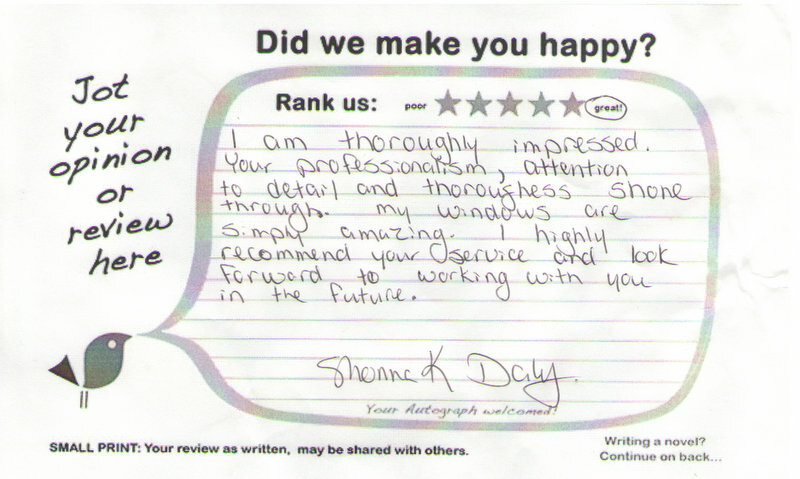 Thank you for your interest in a FREE instant window washing quote! If you are like most homeowners, you don’t do windows! This is due to the fact that window cleaning is time intensive and often difficult and/or dangerous to try and do. It typically involves climbing ladders, hanging out of windows and after almost endless hours of work, chances are you’ll still have smears and streaks. Please fill out the form on the right and immediately after you click the “E-Mail My FREE Instant Quote” button your free instant window washing quote will be in your E-Mail inbox! We would be happy to provide you a no cost, no-hassle estimate at your convenience or you can fill out the form on the right for a FREE instant window washing quote. Also, take a look on the right to see what our most recent customers have to say about us. Our thoroughly trained window cleaning technicians are well prepared to tackle your job, however tough it may be. From interior and exterior cleaning of old multi-paned windows and storm windows to today’s newer dual-paned windows, Niagara Window Washing’s window cleaning service can handle all of your window cleaning needs. After all, clean windows are one of life’s simple pleasures! We also provide Solar Panel Cleaning, we’ll clean your solar panels with the same quality and professionalism as we clean your windows!